WE'RE PREPARING FOR A STORMWATERY FUTURE. After Hurricane Harvey devastated Houston, a lot of people became aware of stormwater as an issue for the first time. But here at Greater Augusta Utility District, we’ve been responsible for proper collection and treatment of stormwater ever since the City of Augusta turned it over to us in 1958. Today, GAUD manages stormwater in the 16.5 square miles of the Augusta Urban Compact Area, and we’ve made great progress in handling it right. While extremely heavy rains have always caused flooding and damage, the problem is magnified by the extensive paving of our modern cities. Rainwater falling on natural terrain used to soak into the earth or run into rivers and eventually the ocean. Which was fine before we added oil, chemicals, and other pollutants to our environment—things we do not want running into our waterways. Augusta has a long history of draining water from structures and streets. Back in the day, to avoid the high cost of installing separate pipes, wastewater and stormwater (rain/snowmelt) were often combined. This made good sense...until it rained a lot and the pipes overflowed into homes, streets or the river, carrying sewage along with the stormwater. This is now called “combined sewer overflow” (CSO), and is prohibited by environmental regulations. See drawing below. Over 100 years later, we are still working to prevent CSO by either separating combined sewer and stormwater systems, or capturing the “first flush” before it overflows to the river. Once the storm passes, we then pump the “first flush” water to the wastewater treatment plant so it can be cleaned. Since the early 1990’s, GAUD has invested millions of dollars to comply with EPA and Maine DEP CSO requirements. The most visible project is along the Rail Trail in Augusta, where you can see above ground concrete boxes that help flush a storage tank buried beneath the trail. In Mill Park, the buried tanks are invisible and have helped spur interest in improving this area. Our compliance efforts have made great progress, reducing sewer discharges to the Kennebec River by 90%, from 73 million gallons (MG) per year in 1989 to 7 MG per year in 2016. Our 4th phase of CSO work, a one million gallon tank near our office on Williams Street and the Augusta Kennebec River boat landing, will be completed by fall, with pump station upgrades completed in 2020. We are working with the Maine Municipal Bond Bank and Maine DEP to finance the project in such a way that the debt payments will start when other debt payments stop. We are pleased to have complied with expensive CSO regulations without litigation. How do we currently charge for stormwater? GAUD is the only utility district in Maine that handles water, wastewater and stormwater, so we have had to figure out how to bill for these three functions equitably ourselves, without reference to neighboring districts. GAUD is also one of very few utility districts in the U.S. that still charges for catch basins (once the sole source of revenue), at $50.89 per month. In addition, we collect a monthly fee of $8.30 per ERU (Equivalent Residential Unit, the runoff impact of a typical single-family residential home’s footprint) from customers in the Augusta Compact Urban Area—residential, commercial, nonprofit and governmental. One ERU represents 2,700 square feet (SF) in Augusta. The cost of compliance, operations and maintenance, however, is projected to exceed our current stormwater fees in the near future, unless we increase revenues. Our proposed new rates are designed to make up the difference and keep our budget balanced. Leave stormwater fees as they are, i.e., charge both catch basin and ERU fees. Change to ERU-based fees only, i.e., eliminate fees for catch basins. Include in the collection system all 59 square miles in the City of Augusta, rather than just the Urban Compact Area. Stormwater that does not end up in GAUD’s system would be exempted (by application). Reallocate costs 50/50 to stormwater/wastewater. The Board of Trustees should engage a consultant to design a stormwater rate system that more accurately reflects actual stormwater-related costs. The GAUD Board should arrange a joint meeting of the Stormwater Workgroup with Charter Review Committee to discuss the how to clarify the boundaries of the GAUD district. Look at the impact of reallocating costs from old sewer pipe projects to the stormwater and sewer accounts in accordance with current practices. The Board then created a Rate Subcommittee and worked with the City of Augusta to forecast costs and revenue from the various options. The Rate Subcommittee made an initial recommendation at the January, 2019 Board meeting, and developed a final recommendation at the March 25th Board meeting. 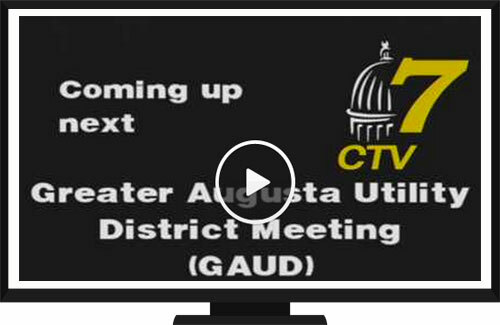 GAUD will hold a Public Hearing about proposed new rates on May 20, 2019. This is being publicly announced to all ratepayers and the general public.